Nolvadex is the common brand name for the active ingredient Tamoxifen Citrate. Nolvadex is a potent nonsteroidal anti-estrogen. 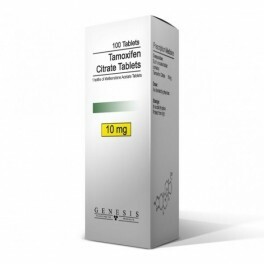 It is indicated for use in estrogen dependent tumors, i.e. breast cancer. Steroid users take Nolvadex to prevent the effects of estrogen in the body. This estrogen is most often the result of aromatizing steroids. Nolvadex can aid in preventing edema, gynecomastia (female breast tissue development/male breasts), and female pattern fat distribution, all of which might occur when a man's estrogen levels are too high. Also, these effects can occur when androgen levels are too low, making estrogen the predominant hormone. This can occur when endogenous androgens have been suppressed by the prolonged use of exogenous steroids. Nolvadex works by competitively binding to target estrogen sites like those at the breast. This drug is not toxic nor have any side effects been seen in athletes who used the drug as an anti-estrogen. This drug is the most popular anti- estrogen amongst steroid users. Nolvadex is mostly used in the Post Cycle Therapy (the cycle started after your steroid cycle), for heavy androgenic steroid cycles Nolvadex should be used throughout the steroid cycle. In the Post Cycle Therapy Nolvadex prevents the effects of high estrogen in the body (prevents Gynecomastia/female breasts), Clomid is used to start your body's natural testosterone production in the testis. HCG is used to prepare the testis (make testis bigger in size/back to orginal size) for its own natural testosterone production. Using Nolvadex and Clomid together is recommended, for high androgenic steroid cycles the use of Nolvadex (everyday throughout cycle), Clomid (commence 2-3 weeks after last injection) and HCG (commence in the last week of steroid cycle/2 weeks) is recommended. Neglecting to do a PCT (going cold turkey) could take anywhere from 3 months to 4 years for your body's natural production of hormones to be restored, also leaving you feeling depleted for months to years (de-masculinized), depressed, body fat accumulation, water retention, female breast tissue development/female breasts and you will notice substantial muscle loss.